How Much Does Your Credit Card Debt Really Cost? While out shopping, you spot an irresistible deal on a garment you have wanted for quite some time. You do not have the cash on-hand or in your bank account to cover the purchase, so you hand the cashier a credit card to cover the cost. When the statement arrives, you make the minimum payment without giving the total balance much thought. The cycle continues until you finally do the math and realize the outstanding balance drastically exceeds the total amount of purchases made. There are several components of the credit card debt equation. The APR, or annual percentage rate, is the amount of interest applied to the outstanding balance each month. On average, cardholders can expect to pay 14 to 25 percent, depending on creditworthiness. It is also important to know that you can be assessed a penalty APR if payment is remitted after the due date. It may seem like a wise idea to only pay the minimum each month since it is affordable, and your account will remain in good standing. However, doing so will cause the debt balances to increase rapidly, keeping you in debt for quite some time. This occurs because the minimum payment is typically comprised of two to four percent of the balance plus interest and fees that have accumulated for the month. So, each time you only pay this amount, you are barely touching the principle and whatever balance remains will be rolled over into the next month's calculation. The following scenarios demonstrate how much your credit card debt really costs over time if you only make the minimum payment. The following chart shows how much making different payments, such as a minimum payment and higher amounts, on low-APR cards will cost over the course of payments, as well as how long it will take you to pay off the card if you never charge another thing on it. The following shows the same scenairos on a high APR credit card. The following chart shows the cost of the charges and the payoff time if you make additional charges of $100 per month while continuing to make a fixed monthly payment. This chart shows how much it would cost and how long it would take to pay off a sofa purchase for $1,200 on a new credit card making minimum payments. Here's a chart for a leather coat purchase for $200 on a new credit card. Quick note: The minimum payment will decrease as your balance decreases, but it is best to stick with a set amount each month. Otherwise, it will take longer to pay off the credit card balance. First and foremost, stop using the credit cards if you are currently saddled down by debt and cannot seem to find a way out. Next, create a spending plan to identify expenses that can be eliminated and re-allocated to your debt-payoff fund. Then, begin making those larger payments and continue searching for ways to reduce expenses to pay the balances off faster. To determine how much you will need to pay monthly to get out of debt, check out the credit card calculators from Bankrate or CreditCards.com. Are you adamant about using credit cards to earn rewards or other perks? Be sure to pay off balances before the interest accrues each month. The grace period prior to the accrual of interest can be found in the terms and conditions of your cardholder agreement. Otherwise, practice discipline by always using cash to make purchases. 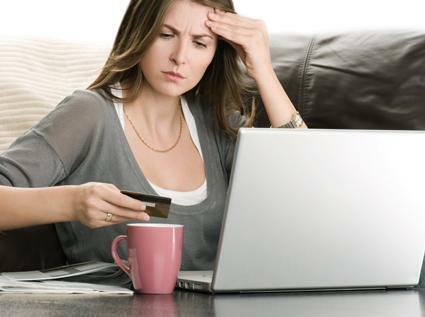 That way, you will avoid wasting your hard earned cash on credit card interest and fees.